Add onion and cook for 3 minutes, stirring occasionally. Add garlic and cook until onions are translucent, 3 minutes, stirring so garlic does not burn. To add whole tomatoes, hold one at a time over pot and squeeze it in your fist, crushing tomato through your fingers, then add sauce remaining in can. Add oregano and red pepper flakes. Simmer sauce, uncovered, for 20 minutes, stirring occasionally. While sauce simmers, in mixing bowl, combine meat, spinach, breadcrumbs, parsley, cheese, egg and pepper, mixing until well-combined. 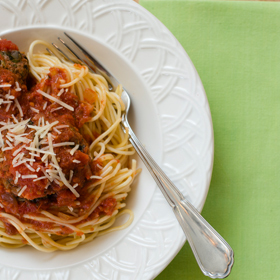 Gently drop uncooked meatballs into sauce, cover, reduce heat to medium low, and simmer until meatballs are cooked through, 40 minutes. If not serving immediately, cool meatballs and sauce together in big bowl until room temperature, then cover and refrigerate for up to 3 days. Reheat, covered, in large pot over medium heat, stirring occasionally. Serve meatballs in a bowl with just Spicy Red Sauce, over spaghetti or polenta, or halved to make meatball sandwiches spooned generously with sauce. Serving size: 1/4 of recipe. Amount per serving: 380 calories, 13g total fat (4g saturated fat), 36g carbohydrates, 36g protein, 9g dietary fiber, 480mg sodium.